After reading this book my perspective on the woods I frequent changed drastically. Tom Wessles takes us through various scenarios particular to New England, and relevant to New York, that help us understand the forces that shaped the woodlands around us. From the effects of mans plight to work and tame the land, to nature’s sometimes destructive forces, you’re given tools and techniques for deciphering the language of the woods in an entertaining and easy to ready package. My woodland walks have change dramatically since reading this book. It’s a must-read for anyone who enjoys hiking in the area and wants to develop a deeper understanding and appreciation of our woodlands. I was also lucky enough to see Tom speak at a Bedford Audubon Society meeting recently. A rare treat that you should take advantage of if given the opportunity. 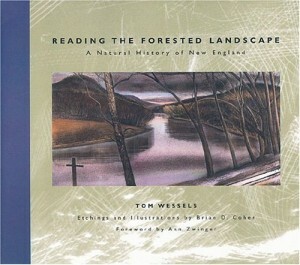 You can pick up Reading the Forested Landscape from Amazon (click the link). This entry was posted in Books and publications on March 23, 2009 by Alex Smoller.